John Raymond Jones, also known as the Harlem Fox, was a Harlem politician and the first African American to lead New York City, New York’s Tammany Hall. Jones was born on November 19, 1899, in Charlotte Amalie on the island of St. Thomas. At the time, St. Thomas was a part of the Dutch West Indies but is now a part of the U.S. Virgin Islands. Jones was the only child of Ansedella Perdereaux, a native of St. Thomas, and Alfred Percival Jones, an immigrant from Barbados. Jones’s father died when he was John was five years old. He attended Lincoln Junior High School and graduated as the top male student of his class in 1915. After school, he had brief jobs and apprenticeships as a shoemaker, tailor, jointer, printer, and dock worker. Jones left St. Thomas after graduating from high school. He first migrated to Puerto Rico where he stayed with his aunt before becoming a sailor briefly and then settling in New York City’s Harlem in 1917. Soon afterward, he met and married his first wife, Christophina Bastian, also an immigrant from St. Thomas. Jones enrolled in a university preparatory school, though he never earned a degree. He also began working as an elevator operator, dock worker, and porter. Jones soon became involved in politics in Harlem in the early 1920s, just as it was rapidly becoming the largest African American community in New York City. His first political job was as an election inspector in 1921. He used that post to register African Americans voters in Harlem. In 1921 Jones delivered voter registration books to the Cayuga Democratic Club, a whites-only democratic club in Harlem but was told he was in the wrong place because of his race. According to Jones, this event galvanized his interest in politics. For the rest of his career, he organized Harlem’s black voters and used his position in the Democratic organization (Tammany Hall) to protect and advance their interests. He taught political skills to Harlemites, including voter registration, political campaigning, and effective petitioning efforts. He also mentored younger politicians such as Adam Clayton Powell, Jr. who in 1944 became the first black congressman from Harlem, U.S. District Court Judge Constance Baker Motley, and David Dinkins who in 1989 became the first black mayor of New York City. Because of his exclusion from the Cayuga Democratic Club, Jones created his own democratic club, the Carver Democratic Club, which eventually replaced the all-white organization. When Jones became the leader of the 21st Council District (Manhattan) in May of 1963, it paved the way for his becoming the first African American to head Tammany Hall. He ran the most powerful Democratic organization in the nation from 1964 to 1967. At the time, he was the highest ranking African American party official in the country. Jones left the position after someone made a corruption accusation against him. Jones returned to St. Thomas in 1970 and stayed there for the next two decades. In 1990 he returned to New York and entered the Greater Harlem Nursing home. On June 9, 1991, John Raymond Jones died of heart failure. He was ninety-one years old. John C. Walter, The Harlem Fox (New York City, State University of New York Press, 1989); “J. Raymond Jones, Harlem Kingmaker, Dies at 91,” http://www.nytimes.com/1991/06/11/obituaries/j-raymond-jones-harlem-kingmaker-dies-at-91.html; “J. Raymond Jones Inside Outside,” http://www.nydailynews.com/archives/news/raymond-jones-article-1.832472; “J. 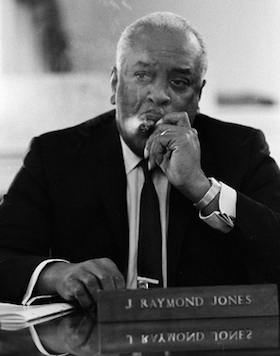 Raymond Jones; New York Political Kingmaker,” http://articles.latimes.com/1991-06-19/news/mn-799_1_j-raymond-jones.